You are receiving this email as a part of your subscription to Economy & Markets. To remove yourself from this email list, please view the information at the bottom of this email. One of the best parenting insights I ever heard was: "Kids don't go to school eating mushed peas and carrots." That is, parents shouldn't obsess over whether their child walked at nine months or 18 months, or could count to 100 by the time he was four years old. By and large, kids will follow a very normal path as they grow up. But the predictable path doesn't stop in kindergarten. We all know of child prodigies who graduate high school at 10 years old and finish their Ph.D. at 16, but those are outliers. Typically kids finish high school at 18 and college (if they go) at 22. These milestones are ingrained in our culture. If we look further, we find other milestones, or stages, in life that are also very predictable by age, and have huge implications for what happens in our economy. Harry Dent, one of the most respected economists in the industry, has uncovered a disturbing market event that could soon devastate millions of investors. In short, he has undeniable proof that one of the market's safest and most popular investments is about to get slaughtered… and it will have dire consequences for those who don't prepare right away. For full details on the event Harry's dubbed as the "Safe-Asset Slaughter"… and to ensure you escape the coming carnage, I urge you to watch this special presentation. We enter the workforce on average between the ages of 20 and 22. We get married around 26 or 27. We spend the most on baby-related items in our late 20s. We buy our first home around 31, and spend the most on breakfast cereal at age 38. We buy the most potato chips at age 42, and dramatically increase our spending on motorcycles at 46. We spend the most overall around 47, and then gently decrease our spending until about 64. Do you see yourself in these statistics? Well, that's what gives us the power to predict. On average, people behave in very predictable ways when it comes to spending money. 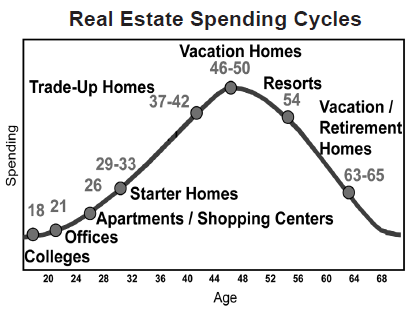 They pass through distinct stages of life at certain ages, and each stage is associated with specific spending patterns. When this information is combined with a detailed breakdown of demographics and several other cycles that Harry monitors, we can develop an accurate picture of where our nation stands economically today, and where it is headed tomorrow. We can practically see around the corner, and we'll help you do the same every day with your Economy & Markets letter. In turn, you can use that information to make very smart personal, business, and investment decisions. Of course, I'd understand if you asked: "Can it really be that simple?" The short answer is: Yes! It can. Baby boomers were born between 1934, and 1961 when they peaked (the generally accepted years are 1946 to 1964, but we count them differently, from the bottom of the wave of births, to get a more accurate numerical picture). This massive wave of people – some 109 million – have been moving through our economy ever since. Using 1961 as our anchor year since it contains the highest number of boomers, we've spent the last 20-plus years successfully forecasting major changes in the economy based largely on what this group will typically buy as they age! Starter homes topped around 1992, when the peak number of baby boomers, those born in 1961, were 31 years old… as we said they would. Trade-up homes peaked in 2005, when the top number of boomers were 44... as we said they would. 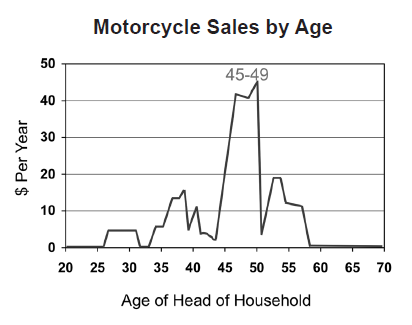 Motorcycle sales enjoyed a good ride until 2007, when those born in 1961 were 46. Just look at Harley Davidson's run up to that point if you're looking for the proof. Around the time of the company's precipitous fall, its CEO, Keith Wandell, warned shareholders that the iconic motorcycle maker faced tough economic headwinds. These forecasts came from our study of demographics and consumer spending patterns alone. In total, we have a hierarchy of four cycles that have, to date, enabled us to call the 2008 crisis, the Japanese collapse, the gold meltdown, and the recent price slide in oil, to name but a few. Those same cycles – the 39-year generational spending wave (demographics), the 36-year geopolitical cycle, the 45-year innovation cycle, and the 30-year commodities cycle – give us a very clear picture of what lies ahead. For those who don't know the methods behind our special brand of (powerful) madness, it may appear to be voodoo economics… but really it's a combination of deep-level research and a study of predictable trends… and then making financial and investment decisions accordingly. That's why we write our monthly newsletter Boom & Bust. It's why we write our daily Economy & Markets letters, and why we're thrilled that you've signed on to receive this invaluable information from us. Ultimately, our unique view of the economy and markets will give you the edge you need. It will put you head and shoulders above others in the market. And right now, you need that edge, because Wall Street and the mainstream media are dishing out incomplete information that can lead you down the wrong, and very painful, path. The boomers who were born in 1961 are now 54, and are struggling with the hard facts of preparing for retirement. Real Estate – Boomers passed through their demand stage for trade up homes a decade ago, which is part of the reason for the housing meltdown we suffered after 2006. There simply weren't enough consumers in the group behind the boomers to keep demand at such a high level. We should see strength in retirement communities in the years ahead, as well as in starter homes as the next generation, the millennials, form their own households. But eventually we'll see the construction industry falter again as the number of boomers dying leaves an increasing number of homes up for sale. Our advice: Consider selling any real estate you own now. There will be time later to buy it back at substantial discounts. When the time comes, look to grabbing property for income purposes. U.S. Dollar – Like I've said already, while slowing down their spending, boomers are also paying down their debts. This makes it very hard for interest rates to rise because there's less demand for loans and more demand for investments that pay interest. All of this leads to a stronger U.S. dollar. There are several other reasons – one of which has to do with the number of aircraft carriers the U.S. has – for why we believe the dollar's best years are still ahead, a point of view that is contrary to many industry experts and members of the mainstream media. Our advice: Invest in a strengthening U.S. dollar, and be sure to read Economy & Markets emails regularly, because we give you details of how to do just that. Oil, Gold, and Other Commodities – As the U.S. economy slows, the demand for raw materials used for construction and commerce also slows, which weighs on the price of goods like oil, copper, etc. The implications of a slowdown based on an aging society don't stop at the shores of the U.S. Most major developed nations have an even bigger issue with an aging population, since they have more people in the later stages of life and fewer children. This is especially true of Germany, long considered the strong man of Europe, and Japan, which has suffered with issues related to an aging population since the early 1990s. The fact that the developed world is aging together means that the world economy is struggling for growth, and will for years to come. This weighs especially heavily on emerging markets that tend to serve as the labor force and raw material vendors to the developed world. Our advice: Steer clear of investments in the emerging market, and don't bet on gold soaring to the moon anytime soon. Luckily, there are some positive outcomes to look forward to as well, but we'll tell you more about those another time, so look out for them each day at around 4:30 p.m. Eastern. We look forward to talking to you again tomorrow. Adam O'Dell, a technical analyst who has fine-tuned a strategy that plays on the cyclical nature of nine market sectors. As such, he is our chief investment strategist and editor of the hugely successful Cycle 9 Alert service, as well as the even faster-paced Max Profit Alert. Charles Sizemore, our fundamentals analyst, a vital cog in our ability to provide you with well-rounded, powerful research that you can use to improve your financial and investment decisions. Charles manages the Boom & Bust portfolio with help from Adam, and writes the portfolio review. He's also the editor of Dent 401k Advisor, a quarterly addendum to Boom & Bust. Lance Gaitan, the team member who works with U.S. Treasurys and the bond markets. He's developed a system called Treasury Profits Accelerator that can capitalize on micro-moves in interest rates, as much as 100% in four days. John Del Vecchio, an elite shorting strategist we recruited to profit from the market's inevitable turn downward. John manages the AdvisorShares Ranger Equity Bear ETF. For Dent Research, he runs a trading service called Forensic Investor, where he looks behind the numbers to find which market giants are fudging their numbers, hence providing valuable shorting opportunities. And Ben Benoy, our resident U.S. Marine, who is the creator of a trading platform that uses social media (yes! you read that correctly) to identify opportunities in the biotech field. Together, they bring you their unique point of view and research approach in the "Market Insight" section of Economy & Markets every day… so be sure to look out for it. If you're rich, protect your gains now before Rome falls. Backing us up with the most comprehensive and global analysis we've seen yet. Is it going to be up or down? Thank you for signing up for our free daily eletter, Economy & Markets. We have a free report to give you, as a token of our appreciation. We believe you'll find it invaluable, so download it here. Six days a week we'll use our in-depth research on consumer spending patterns, demographic trends, economic cycles and technology adoptions to arm you with the information you need to make the best financial, business and investment decisions possible. After all, knowing what consumers are going to buy next... or what they'll stop buying next... is the best way to maximize your income and profits, and protect your portfolio. You'll receive your first issue of Economy & Markets in the next few days. What you need to know before then is that demographics is destiny. Consumers drive the economy. And consumers are highly predictable creatures. Right now, baby boomers are retiring en masse? I'm sure you've already heard the statistic that 10,000 boomers will retire every day for the next 19 years. This disappearance of a quarter of the population from the workforce is something we like to call the Demographic Cliff and it's on the horizon of nearly every developed country the world over. Come to that, emerging markets face this demon as well, but much further down the road. The thing is, as generations move through their predictable spending cycle, they fuel booms and busts... in markets, companies and economies. Harry Dent, creator of the Dent Method, founder of Dent Research and Senior Editor of Economy & Markets, has recorded a brief video to tell you more about this. Listen to it now. Again, from all of us here at Economy & Markets, welcome. Protected by copyright laws of the United States and international treaties. This eletter may only be used pursuant to the subscription agreement and any reproduction, copying, or redistribution (electronic or otherwise, including on the worldwide web), in whole or in part, is strictly prohibited without the express written permission of Delray Publishing. This work is based on SEC filings, current events, interviews, corporate press releases and what we’ve learned as financial journalists. It may contain errors and you shouldn’t make any investment decision based solely on what you read here. It’s your money and your responsibility. The information herein is not intended to be personal legal or investment advice and may not be appropriate or applicable for all readers. If personal advice is needed, the services of a qualified legal, investment or tax professional should be sought. We expressly forbid our writers from having a financial interest in any security recommended to our readers. All of our employees and agents must wait 24 hours after on-line publication or 72 hours after the mailing of printed-only publication prior to following an initial recommendation. Please note: We sent this e-mail to you because you subscribed to this eletter. My clash with The Young Turks host Cenk Uygur starts at 8:00 PM ET live on my Facebook Page. Please tune in live by clicking the button below, and please forward this email to others who might want to watch! P.S. Tweet your thoughts during the debate so I can read them! Use #DSouzaUygur on Twitter. Email sent to us@peninsulateaparty.org on June 26, 2016. Last weekend, I got to celebrate both Father's Day with Danielle and three months of wedded bliss with Debbie, and I am so thankful for the blessing of having both of these incredible women in my life! This weekend will be a little less pleasant, because on Sunday it's me against The Young Turks' host Cenk Uygur at Politicon, and only one of us will be left standing! The Young Turks have made a hobby out of insulting me, but I have a feeling they'll be a little less smug after our debate. Will you tune into the livestream from the debate on Sunday and support me? I'll be watching to see how many fans join me for the showdown! The Young Turks has a big audience, but I want to show that my audience is bigger and more engaged, so please tune in and share your comments during the debate! The livestream will take place right on Facebook, and it's completely free. All you have to do is like my Facebook Page so you'll find out when we go live. I hope you'll tune in on Sunday! Deadline Hollywood and The Hollywood Reporter both weighed in on the trailer immediately, with Deadline calling it "a scathing indictment of the presumptive Democratic nominee and the party of the Clintons, Obama, JFK and LBJ." Wow! Even some mainstream publications can't help but see the truth about the corruption of the left. If you like the new trailer, please share it! Hillary's America will expose the truth about the corrupt veins that run throughout the Democratic Party. This is the time we can and must make a difference for America. See you in theaters on July 22! P.S. There is no better way to send a message to the thugs and crooks of the Democratic Party than by reserving a theater in your town and organizing a group showing of this hard-hitting exposé. Learn more. Email sent to us@peninsulateaparty.org on June 24, 2016.